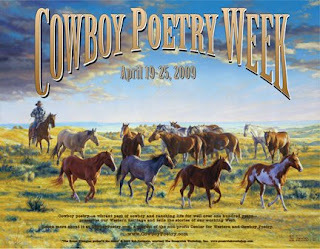 You may have missed it—maybe you were distracted by the fuss that the Academy of American Poets kicks up about National Poetry Month out on the east coast each year—but April 19-25 was Cowboy Poetry Week to folks out West. It has been since April 11, 2003, in fact, when the U.S. Senate, led by a bipartisan group of Senators from Kansas, Montana, Nevada and Utah, unanimously passed a resolution recognizing "National Cowboy Week." Conrad Burns, a Montana Republican and one of the resolution's sponsors, explained, "Many think cowboys are a thing of the past, but I can tell you otherwise. In many western states like Montana, cowboys gather around a campfire and swap stories just as frequently as they did one hundred years ago. This oral tradition is now captured in written form as well, and several websites are dedicated solely to preserving and disseminating cowboy poetry and its history. My resolution will recognize the contribution of cowboy poetry to our history of the West, but also to mark it as a thriving tradition that continues even today." Senator Burns is not just, uh, horsing around here, though that doesn't mean one can't wonder at the same time how much his soaring rhetoric calibrates with everyday life. Y'all might ask, for example, exactly how "thriving" is the thriving tradition of cowboy poetry that Burns extols and how, precisely, has this poetry really shaped the history of the West? Or, alternately, ya might query whether today's cowpokes really gather round campfires as often as they did a century ago—or whether they actually turn, instead, to their PC's and PowerMacs to make the range a little more like home? How, in other words, has trading in barbed wire for FireWire changed the way people out west rustle up their verse? But one thing Senator Burns is not is wrong: cowboy poetry is alive—not just at highly-staged festivals, in the U.S. Senate chambers, or around century-old campfires burning a mixture of nostalgia and anachronism. Take, for example, the Rosebud-Treasure County Brand Book (pictured to the left), a spiral-bound book published in 1983 that records the various marks and brands of livestock owners from two adjacent counties in Burns's home state of Montana. The publication is not strictly a reference book, though. More like one of the farmer's almanacs from the 18th or 19th centuries which combined calendars with facts, figures, tasty morsels of historical advice, and—of course—lots of poetry, this Brand Book mixes together verse, anecdotes, jokes, stories, and even a glossary defining once-colloquial terms such as "dally," "kack," "slick fork," and "town hole." In other words, the Rosebud-Treasure County Brand Book is not just a handy-dandy reference guide designed to identify, record, and sort out the American West's ideogrammatic language of private property ownership, but it's also a sourcebook containing the markings—linguistic and otherwise—of a region's cultural property as well. With rolls of this yere fancy crepe. And a catalog lyin' around. And then reach for a prickly pear. Poetry & Popular Culture can't say for sure whether Senator Burns would cite "The Big Sissies" as evidence that cowboy poetry is thriving, but he could do worse, we think, than rope this one into the conversation. 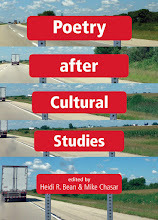 Whether and how it, and other poetry like it, contributes to the history of the west and the maintenance of a system of property that isn't just private is another question—and one, say we, that is definitely worth askin'. Like, totally, dude.